Once there was a conversation between Lord Bramha and Saint Valmiki about beautifulness of Lord Vishnu in Sayana pose. This conversation led to fight between the two. Lord Vishnu appeared before them and said "In Sayana pose I am beautiful here". So Lord Vishnu was called as "Vadhivazhagiya Nambi". Once when Manduga Maharishi was in penance under water. Saint Dhuruvaasar waited for him on the water shore long time. Since Saint Mandugar has not turned up, Saint Dhuruvaasar cursed him to become frog. So Saint Mandugar came to this place and did penance on Lord Vishnu. Lord Vishnu appeared before him and whipped off the curse given Saint Dhurvaasar and Saint Mandugar regained his form. So this place was previously called as "Mandugaapuri". The pond here is also called as "Manduga Theertham". Once when Thirumezhisai Alwar came here, he was teased to a great extent by the people. He taught of teaching them a lesson and sung a song on Lord Vishnu to appear on him and make the people know that he is Lord Vishnu's ardent devotee, and Lord Vishnu came out of Thirumezhisai Alwar and appeared here as "Vadhivazhagiya Nambi" to make Thirumezhisai Alwar to teach them a lesson. Thirumazhisaialwar has sung in praise of this sthalam - 2417. Access to the temple About 15 miles from Trichy. We can reach Anbil from Lalgudi Station, from which Anbil is located four miles eastward. 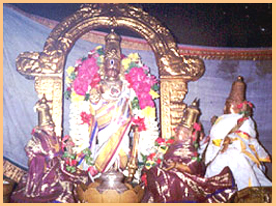 The Moolavar of this Sthalam is Vadivazhagiya Nambi. Moolavar in Kidantha Kolam and in Bhujanga sayanam and facing East direction. Prathayaksham for Lord Brahma and Vaalmiki. This temple is around 7 kms from Lalgudi on Trichy - Kallanai Road. There is no much frequent buses from Trichy. Or if we just cross the river Kollidam from another vaishnavite temple called "Koviladi" we can reach "Anbil". It is approximately 2 kms from "Koviladi". There is no much facilities available here. So we should stay either at Trichy or at Koviladi and reach this temple.